Keep an eye on Chinese bankruptcy proceedings and Dr. Shi’s eroding worth. Suntech (NYSE: STP), the once-lauded Chinese solar PV module firm, is in default of its bonds and is stumbling toward bankruptcy in advance of some type of presumed government ownership. Suntech's home town in China, Wuxi, is going to provide the funding to keep the local factory and its 10,000 employees up and running. This report comes from Reuters and confirms an earlier report from the New York Times on the Wuxi bailout. Suntech's bankruptcy will become a high-profile test of China's bankruptcy laws and whether investors in and outside of China can recover some some of their funds. According to the Financial Times, "Under Chinese law, foreign bondholders would be reimbursed only after domestic creditors, which means bondholders may end up with very little." The Economist writes, "[E]ven if a rescue package is organized, foreign investors are going to lose a packet." Shi Zhengrong, Suntech's founder, was once called "The Sun King" and was China's richest man, with a worth from Suntech of approximately $1.7 billion. According to Bloomberg, "His roughly 30 percent stake today is down to about $32 million, if shareholders get anything out of the Chinese bankruptcy process." Warranties for solar panels in the U.S. "are backstopped by Suntech Power Holdings, which has not entered into any bankruptcy proceedings. Similarly, Suntech America is still operating and is not in the Wuxi bankruptcy proceedings," according to a source close to the case. The New York Stock Exchange is reviewing the listing of Suntech's U.S.-traded shares. Note Suntech's steadily declining market share figures for U.S. residential and commercial solar in 2012 as installers shied away. Table from GTM Research's U.S. PV Leaderboard, which tracks the top commercial and residential installers and module suppliers in the U.S. solar market. Commercial developers with Suntech as a top supplier include SPG Solar, Consolidated Edison, and Nexamp. Residential installers with Suntech as a top supplier include Astrum Solar, Solar Universe, and Sungevity. 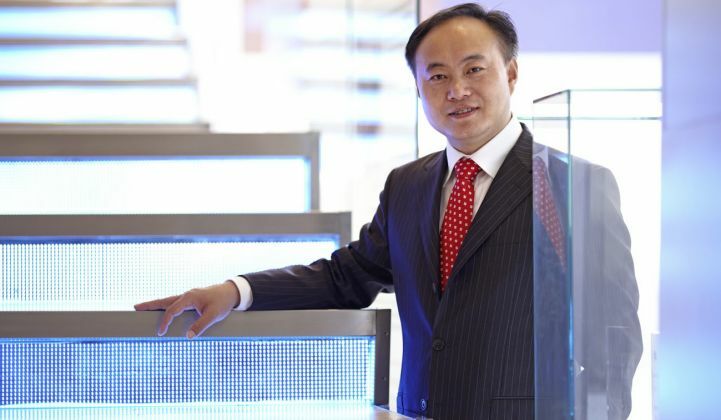 Boardroom tilts to Wuxi: Dr. Shi is out as Chairman and Weiping Zhou, former chairman of Wuxi Guolian Futures, a state-owned finance firm, is now President and Executive Director. Wuxi Guolian is Suntech's hometown and the anticipated source of Suntech's rescue money. Jiangsu approves bankruptcy plan: The Securities Times reports that the Jiangsu provincial government has approved Suntech's bankruptcy plan, according to Patrick Chovanec, Managing Director, Chief Strategist at Silvercrest Asset Management. The report is due on Wednesday. Last week, China's Suntech entered into an agreement with most of its bond holders to delay a payment of $541 million until May 15, according to a statement. Aaron Chew of Maxim Group viewed that action as a default, with an involuntary bankruptcy filing likely the next shoe to drop. And in fact, Suntech has just announced that it has defaulted on its 3 percent convertible notes. According to Bloomberg (citing Moody's), "No company has defaulted on publicly traded debt in China since the central bank began regulating the market in the late 1990s." Suntech was the world's largest manufacturer of solar modules in 2011. As we wrote last week, any pretense of Suntech being an independent entity is now over. Suntech, faced with $2 billion in debt and with the fate of thousands of employees' jobs hanging in the balance, "is poised to be taken over partly or entirely by the municipal government's holding company in its hometown, Wuxi, China," according to reports in the New York Times after a confirmation from a Wuxi official on Wednesday of last week. Wuxi, with billions of assets across a variety of industries, had been the rumored acquirer for a number of months. This news comes on the heels of mounting losing quarters and a boardroom coup involving the removal of Suntech's wealthy founder as chairman, and the shuttering of its 50-megawatt Goodyear, Arizona solar panel factory. In July 2012, Suntech's business partner, Global Solar Fund (GSF), faked $680 million in collateral for a loan backed by Suntech. Suntech's stock price has fallen more than 90 percent over the last five years. Late last year, LDK (NYSE: LDK), also financially troubled and also based in China, and one of the world's largest producers of solar wafers and high-purity polysilicon, sold a 20 percent stake to Heng Rui Xin (HRX) Energy, a Chinese state-run entity, for approximately $23 million. In a roughly similar situation, Chaori Solar, avoided default when the local government stepped in. Suntech awaits the Wuxi government's intervention. If Suntech does declare bankruptcy it will be one of the largest implosions by a Chinese firm listed on an American exchange. In an interview on NPR, Beijing-based economist Patrick Chovanec said of China's solar industry, "Well, they have a dozen Solyndras." But Chovanec concluded that in China, "Well, what they probably do is they dig deep into their pockets -- the pockets of the central government -- and bail out these companies. Because what they're really afraid of is, you know, we've seen this over the past couple of months, that even relatively small companies, when they fail in China, they're so intertwined in terms of their credit relationships and the local economy that essentially everything's too big to fail."